If you’re buying a Christmas gift for a toddler in 2016, here’s my round-up of the 10 best toys to buy a 2 year old in 2016. Most lists of the best must-have Christmas toys are aimed at older children and contain very little for toddlers. 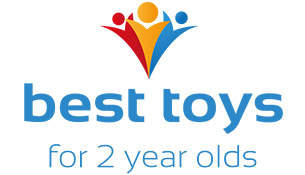 This list only contains toys that are suitable as gifts for 2 year olds or younger. 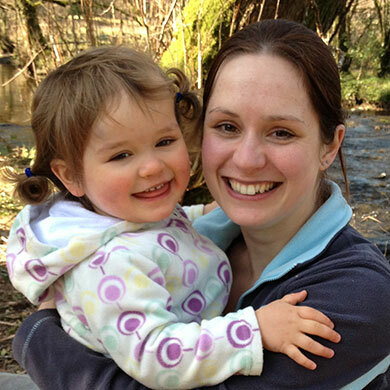 I’ve included toys for boys and girls, and children with different tastes and interests. 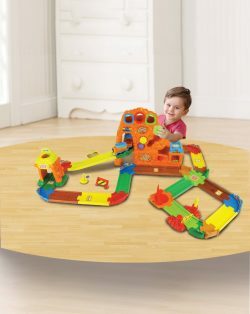 The Vtech Toot Toot Goldmine Train Set has to be first on my list. All over the world, it has been predicted as 2016’s no. 1 Christmas toy for toddlers and young children. It has everything that a toddler or 2 year old would want in a Christmas toy. Children will love combining the 32 pieces to create train tracks in different shapes. They can watch the motorised train move along the tracks and go in and out of the gold mine. This Christmas toy even helps with toddlers’ language development as the vehicles speak at different points around the track. There are 3 sing-along songs and 17 tunes to keep toddlers entertained. If that wasn’t enough, the gold mine doubles as a shape sorter toy. It even has a drop chute which any 2 year old will enjoy putting things down. 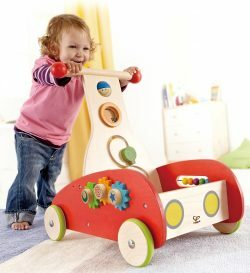 The cog toys help to build toddlers’ motor skills and dexterity. Any toddler will love a Wheelbug Ride-On toy for Christmas 2016. I have linked to the ladybird as it’s very popular but if you click through and look at the related items on the page, you can also buy a ride-on tiger, pig, bee, cow or mouse. 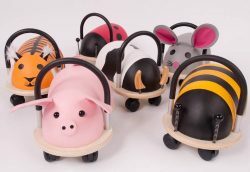 All these wooden ride-on toys are beautifully made and super-cute. My niece has the ladybird and loves it. The Labebe Wooden Baby Walker is perfect for toddlers and 2 year olds, up to age 4 or 5. Made from sturdy wood, it’s a much more tasteful toy to have in your house than the plastic monstrosities that most toddlers end up with. The building blocks will keep 2 year olds entertained and help to build their dexterity skills. They can make more complex structures as their hand eye co-ordination and imaginative play skills develop. The cute fox pattern will appeal to boy or girl toddlers. 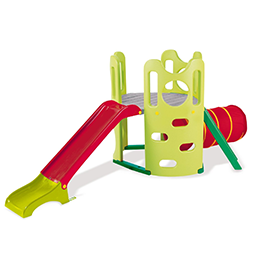 The Hape HAP-E0370 Wonder Walker is just as much an activity center as a walker. It’s tastefully designed, with solid wooden construction. It has plenty of moveable knobs, gears and colourful balls for toddlers to play with. 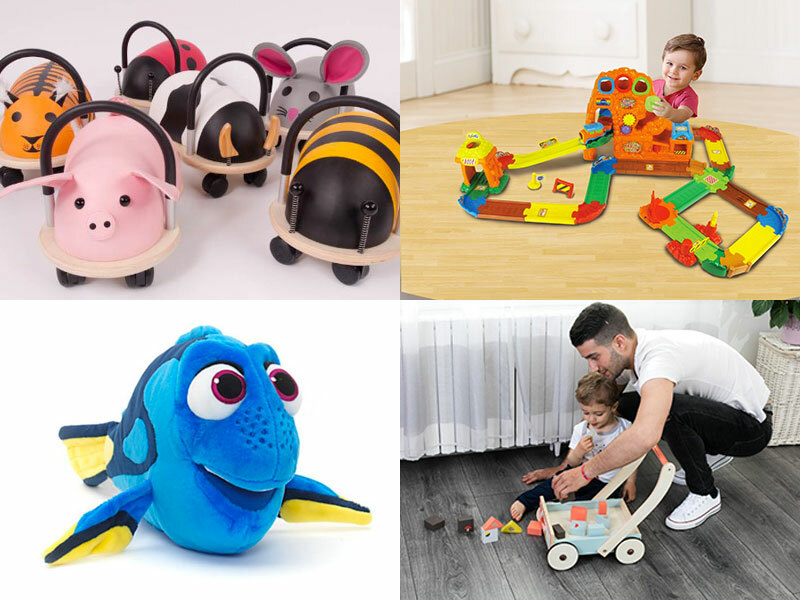 If you’re looking for a low-cost Christmas 2016 gift for toddlers then a push along toy is a great option. 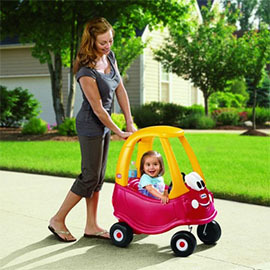 Toddlers and 2 year olds love push and pull along toys – I have no idea why but they really do love them! 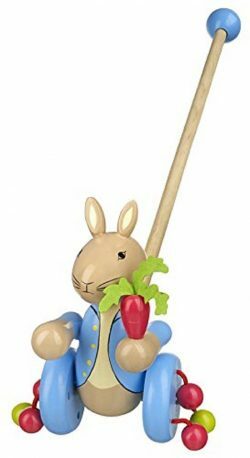 This Peter Rabbit push-along toy combines toddlers’ love of pushing things along with their love of Peter Rabbit. It’s beautifully made and something they will treasure. The Mini Micro Deluxe Scooter is at the top of many toddlers’ Christmas list in 2016. 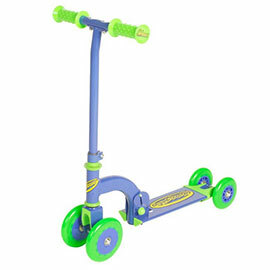 It’s strong and sturdy enough for toddlers and 2 year olds to ride safely. The handlebar height is adjustable so you can fit it to your child. 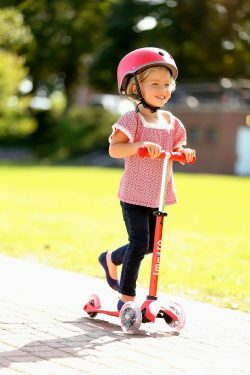 While it’s definitely more of a ‘main’ Christmas present due to the price, this scooter will last your 2 year old from toddlerhood up to about 5 years, so you will get your money’s worth. I have linked to the red scooter but if you click through and look at the related items then you can find other colours. You can also see various extras such as safety helmets lower down the page. Toddlers and 2 year olds love watching their parents do things around the house. They use this to develop their own imaginative play, copying what they have seen their parents doing. Most boy toddlers – and lots of girls too – love toy tool kits. The Bigjigs Toys BJ311 Red Tool Belt has fantastic reviews and is a nice twist on the traditional toy tool kit. 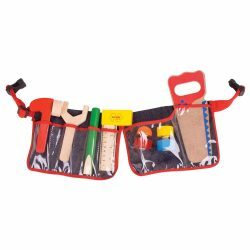 The toy tools pack away neatly into the pockets and toddlers will feel so grown-up wearing the belt around the house, pretending to do DIY! It’s also a cheap Christmas gift, so it’s great as a stocking filler or if you don’t have much to spend for Christmas 2016. Duplo is great for toddlers’ Christmas gifts as it’s just the right age-level for them. Lego is still too difficult, not to mention those tiny easy-to-swallow pieces. There are loads of Duplo toys for 2 year olds but the Duplo Number Train is really popular this Christmas. It’s more educational than a lot of Duplo sets, while still being fun. It has 10 numbered Duplo bricks which toddlers will enjoy putting in order. 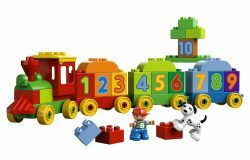 There are 3 wagon bases for building the number train, and various other Duplo bricks. This toy helps toddlers learn to count as well as boosting their dexterity and imaginative play skills. All the 2 year olds I know love making pretend food. 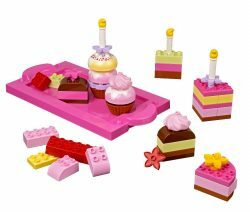 The LEGO DUPLO 6785: Creative Cakes toy is a great 2016 Christmas gift as it’s just so cute. You get 2 muffin cups, 3 muffin tops, 3 candles, 2 meringues, flowers and assorted LEGO DUPLO bricks. Toddlers will love combining them to make different cakes and then feeding them to you (or eating them themselves!). You get a book of recipes or children can just make any cakes they choose in a range of colours and ‘flavours’. The storage lid can be used as a serving tray, so toddlers can host their own tea parties. The new Finding Dory film is popular with toddlers and 2 year olds this Christmas. As a result, a Finding Dory toy is one of the best Christmas 2016 gifts for toddlers. 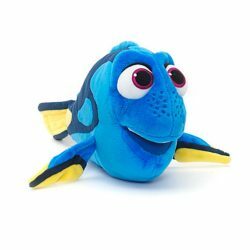 The Official Disney Finding Dory 30cm Dory Soft Plush Toy is suitable for this age range. It’s nicely made and lovely and cuddly. At 30cm, it’s the perfect size for toddlers to cuddle. And for an extra special Christmas toy, why not buy the cuddly Dory with her friend Nemo!